Messier 81 (also known as NGC 3031 or Bode's Galaxy) is a spiral galaxy about 12 million light-years away in the constellation Ursa Major. Due to its proximity to Earth, large size and active galactic nucleus (which harbors a 70 million M☉ supermassive black hole), Messier 81 has been studied extensively by professional astronomers. The galaxy's large size and relatively high brightness also make it a popular target for amateur astronomers. 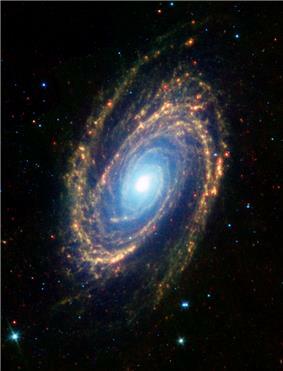 Messier 81 was first discovered by Johann Elert Bode in 1774. Consequently, the galaxy is sometimes referred to as "Bode's Galaxy". In 1779, Pierre Méchain and Charles Messier reidentified Bode's object, which was subsequently listed in the Messier Catalogue. Most of the emission at infrared wavelengths originates from interstellar dust. This interstellar dust is found primarily within the galaxy's spiral arms, and it has been shown to be associated with star formation regions. The general explanation is that the hot, short-lived blue stars that are found within star formation regions are very effective at heating the dust and hence enhancing the infrared dust emission from these regions. 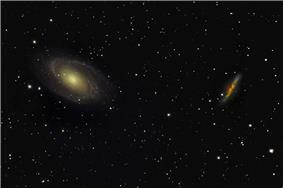 Only one supernova has been detected in Messier 81. The supernova, named SN 1993J, was discovered on 28 March 1993 by F. Garcia in Spain. At the time, it was the second brightest supernova observed in the 20th century. The spectral characteristics of the supernova changed over time. Initially, it looked more like a type II supernova (a supernova formed by the explosion of a giant star) with strong hydrogen spectral line emission, but later the hydrogen lines faded and strong helium spectral lines appeared, making the supernova look more like a type Ib. Moreover, the variations in SN 1993J's luminosity over time were not like the variations observed in other type II supernovae but did resemble the variations observed in type Ib supernovae. Hence, the supernova has been classified as a type IIb, a transitory class between type II and type Ib. The scientific results from this supernova suggested that type Ib and Ic supernovae were actually formed through the explosions of giant stars through processes similar to those taking place in type II supernovae. 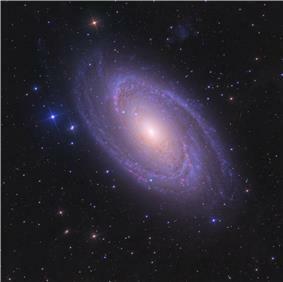 The supernova was also used to estimate a distance of 8.5 ± 1.3 Mly (2.6 ± 0.4 Mpc) to Messier 81. As a local galaxy, the Central Bureau for Astronomical Telegrams (CBAT) tracks novae in M81 along with M31 and M33. ^ Jensen, Joseph B.; Tonry, John L.; Barris, Brian J.; Thompson, Rodger I.; Liu, Michael C.; Rieke, Marcia J.; Ajhar, Edward A.; Blakeslee, John P. (2003). "Measuring Distances and Probing the Unresolved Stellar Populations of Galaxies Using Infrared Surface Brightness Fluctuations". ^ Karachentsev, I. D.; Kashibadze, O. G. (2006). "Masses of the local group and of the M81 group estimated from distortions in the local velocity field". ^ Dreyer, J. L. E. (1988). Sinnott, R. W., ed. The Complete New General Catalogue and Index Catalogue of Nebulae and Star Clusters. ^ a b c d e f g h i j k "NASA/IPAC Extragalactic Database". Results for NGC 3031. Retrieved 2006-11-10. ^ "SIMBAD-M81". SIMBAD Astronomical Database. Retrieved 2009-11-28. ^ Armando, Gil de Paz; Boissier, Samuel; Madore, Barry F.; Seibert, Mark; Joe, Young H.; Boselli, Alessandro; Wyder, Ted K.; Thilker, David; Bianchi, Luciana; Rey, Soo-Chang; Rich, R. Michael; Barlow, Tom A.; Conrow, Tim; Forster, Karl; Friedman, Peter G.; Martin, D. Christopher; Morrissey, Patrick; Neff, Susan G.; Schiminovich, David; Small, Todd; Donas, José; Heckman, Timothy M.; Lee, Young-Wook; Milliard, Bruno; Szalay, Alex S.; Yi, Sukyoung (2007). "The GALEX Ultraviolet Atlas of Nearby Galaxies". ^ "SIMBAD Astronomical Database". Results for NGC 3031. Retrieved 2006-11-10. ^ Devereux, N.; Ford, H.; Tsvetanov, Z.; Jocoby, J. (2003). "STIS Spectroscopy of the Central 10 Parsecs of M81: Evidence for a Massive Black Hole". ^ a b c d O'Meara, S. J. (1998). The Messier Objects. ^ a b Jones, K. G. (1991). Messier's Nebulae and Star Clusters (2nd ed.). ^ a b Willner, S. P.; Ashby, M. L. N.; Barmby, P.; Fazio, G. G.; Pahre, M.; Smith, H. A.; Kennicutt Jr., R. C.; Calzetti, D.; Dale, D. A.; Draine, B. T.; Regan, M. W.; Malhotra, S.; Thornley, M. D.; Appleton, P. N.; Frayer, D.; Helou, G.; Stolovy, S.; Storrie-Lombardi, L. (2004). "Infrared Array Camera (IRAC) Observations of M81". ^ a b c Gordon, K. D.; Pérez-González, P. G.; Misselt, K. A.; Murphy, E. J.; Bendo, G. J.; Walter, F.; Thornley, M. D.; Kennicutt Jr., R. C.; Rieke, G. H.; Engelbracht, C. W.; Smith, J.-D. T.; Alonso-Herrero, A.; Appleton, P. N.; Calzetti, D.; Dale, D. A.; Draine, B. T.; Frayer, D. T.; Helou, G.; Hinz, J. L.; Hines, D. C.; Kelly, D. M.; Morrison, J. E.; Muzerolle, J.; Regan, M. W.; Stansberry, J. A.; Stolovy, S. R.; Storrie-Lombardi, L. J.; Su, K. Y. L.; Young, E. T. (2004). "Spatially Resolved Ultraviolet, Hα, Infrared, and Radio Star Formation in M81". ^ a b Pérez-González, P. G.; Kennicutt Jr., R. C.; Gordon, K. D.; Misselt, K. A.; Gil De Paz, A.; Engelbracht, C. W.; Rieke, G. H.; Bendo, G. J.; Bianchi, L.; Boissier, S.; Calzetti, D.; Dale, D. A.; Draine, B. T.; Jarrett, T. H.; Hollenbach, D.; Prescott, M. K. M. (2006). "Ultraviolet through Far-Infrared Spatially Resolved Analysis of the Recent Star Formation in M81 (NGC 3031)". ^ "NASA/IPAC Extragalactic Database". Results for extended name search on NGC 3031. Retrieved 2007-02-27. ^ Ripero, J.; Garcia, F.; Rodriguez, D.; Pujol, P.; Filippenko, A. V.; Treffers, R. R.; Paik, Y.; Davis, M.; Schlegel, D.; Hartwick, F. D. A.; Balam, D. D.; Zurek, D.; Robb, R. M.; Garnavich, P.; Hong, B. A. (1993). "Supernova 1993J in NGC 3031". ^ a b c Schmidt, B.P. ; Kirshner, R.P. ; Eastman, R.G. ; Grashuis, R.; Dell'Antonio, I.; Caldwell, N.; Foltz, C.; Huchra, John P.; Milone, Alejandra A. E. (1993). "The unusual supernova SN1993J in the galaxy M81". ^ a b c Filippenko, A. V.; Matheson, T.; Ho, L. C. (1993). "The "Type IIb" Supernova 1993J in M81: A Close Relative of Type Ib Supernovae". ^ Benson, P. J.; Herbst, W.; Salzer, J. J.; Vinton, G.; Hanson, G. J.; Ratcliff, S. J.; Winkler, P. F.; Elmegreen, D. M.; Chromey, F.; Strom, C.; Balonek, T. J.; Elmegreen, B. G. (1994). "Light curves of SN 1993J from the Keck Northeast Astronomy Consortium". ^ Wheeler, J. C.; Barker, E.; Benjamin, R.; Boisseau, J.; Clocchiatti, A.; De Vaucouleurs, G.; Gaffney, N.; Harkness, R. P.; Khokhlov, A. M.; Lester, D. F.; Smith, B. J.; Smith, V. V.; Tomkin, J. (1993). "Early Observations of SN 1993J in M81 at McDonald Observatory". ^ Richmond, M. W.; Treffers, R. R.; Filippenko, A. V.; Palik, Y.; Leibundgut, B.; Schulman, E.; Cox, C. V. (1994). "UBVRI photometry of SN 1993J in M81: The first 120 days". ^ Filippenko, A. V.; Matheson, T.; Barth, A. J. (1994). "The peculiar type II supernova 1993J in M81: Transition to the nebular phase". ^ Bishop, David. "Extragalactic Novae". supernovae.net (International Supernovae Network). Retrieved 2010-09-11. ^ a b Karachentsev, I. D. (2005). "The Local Group and Other Neighboring Galaxy Groups". ^ a b c Yun, M. S.; Ho, P. T. P.; Lo, K. Y. (1994). "A high-resolution image of atomic hydrogen in the M81 group of galaxies". ^ a b c Eicher, D. J. (1988). The Universe from Your Backyard.